Give your look a personal edge with this "Emily" nameplate necklace. Created in luxurious sterling silver, this necklace is the perfect sweet accessory to compliment any style. This nameplate pendant is set on a 16" chain with a 2" adjustable clasp. Sterling Silver Emily Nameplate Necklace is rated 5.0 out of 5 by 1. Rated 5 out of 5 by Anonymous from name plate necklace. 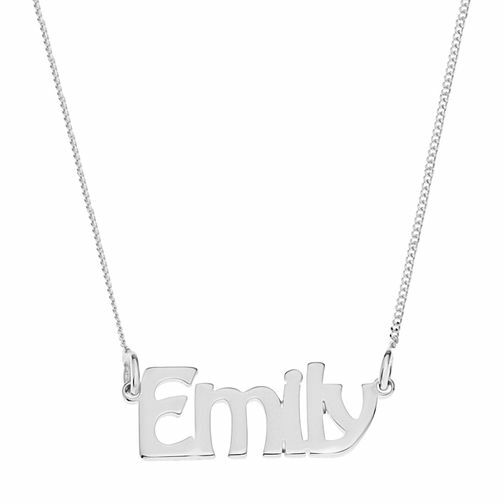 A beautiful silver named necklace personalised with the name EMILY. Purchased to replace a lost children's version. Sits lovely on the neck . Options of different font graphics and beautifully presented.